On Friday the 13th of February I went to Lush. I love going into Lush. They have lots of great products and their staff are always very knowledgeable. I will also admit the staff tend to be attractive. Lush have good ethical policies. In writing this though I’ve realised that that is not unique as there is an EU ban on animal testing on cosmetics. Nevertheless I really enjoy Lush’s products and the mingling smells of the shop. On this instance I was shopping for someone else. I assume you can work out, from the date, what I was shopping for. I bought a bath bomb, a floating flower, and a knot wrap for it all. Now comes the time of embarrassment. I’d asked for the products to be wrapped up but when I got home I discovered something else in the bag. My first assumption was that the lady had only wrapped one of my items. After examining the knot wrap I discovered I’d been given something extra. Specifically it was a tisty-tosty. With it was the card you can see on the right. Like I said I’m embarrassed. I’d been given this extra something and my first thought was that some mistake had been made. I must compliment the staff for their slight of hand. I didn’t notice her pick up the tisty-tosty or write her message to me on the back of the card. All I knew was that I’d asked not to have a bag and they gave me one anyway. I discovered this extra bomb when I was on the train. With that sentence this post has been flagged by the FBI, CIA, MI5, and MDF or whoever. The funny thing is that I’ve been living in a house without heating or hot water for the last few weeks. My dear old boiler died before Christmas and I’ve finally been able to get a new one. This meant no baths and no showers just a normal wash using a kettle. Well using water from a kettle actually. So it was great timing to have a bomb for my bath. 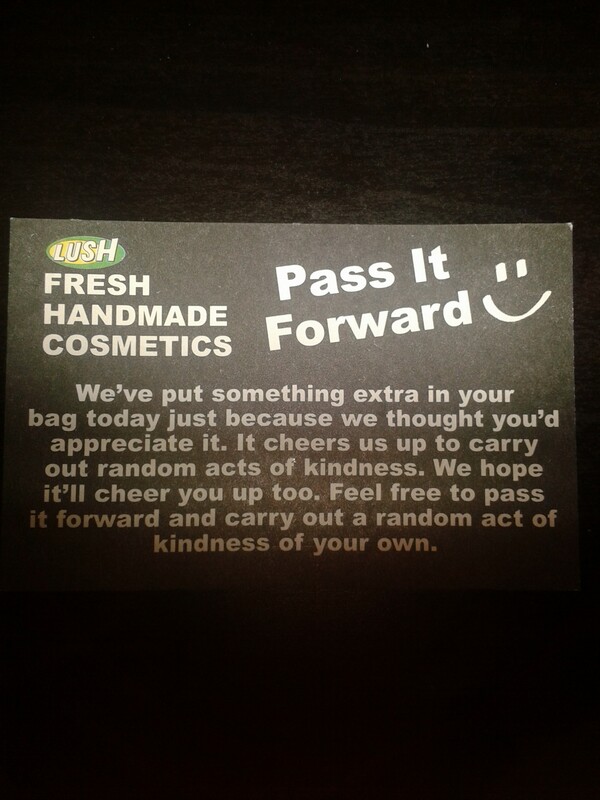 I love the idea of pay (pass) it forward and should think of something to do. I did make a charitable donation afterwards, I was ambushed by one of the street people, so maybe that counts. The best lush product has got to be the olive branch shower gel! Get it if you can, it’s glorious!!! Thanks. I’ll have a look at that.